The new IGA in Knowlton has a full line of ready-made deli foods as well as a complete range of biological and natural foods a traditional grocery store. Large and spacious the IGA opened in 2006 and is the best place for groceries in Knowlton. Perfect for all your camping food supplies and weekend at the lake goodies. There is also a DVD rental shop, flowers and wine selection. This artisan bakery has the best homemade bread in the region and has a loyal customer base who come from all over the world for the special recipes. Featuring traditional style French baguettes as well as specialty mixes and wonderful fuccacias with tomatoes and mushrooms. No sweets or croissants are available but the variety of unique breads is worth the visit. 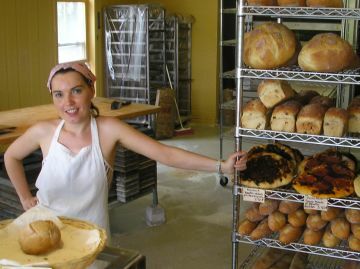 Panissimo is the best place for fresh bread in Knowlton. The Star Café, located on the corner of Lakeside and Victoria beside the Bank of Montreal and kitty corner to City Hall, is a popular place for specialty coffees, lunch, sandwiches or a light meal with a beer or glass of wine. Summer at the Star Cafe is usually crowded as the outdoor terrasse under the trees is a popular place for travelers to stop for a break. The Star Café offers a daily special, as well as desserts and panini sandwiches and salads. The café also displays paintings and photographs by local artists and is one of Knowlton's best places to "hangout". Fully licensed with an outdoor deck to enjoy the fresh air and sights. Café Floral serves a variety of meals, snacks, desserts and specialty coffee and teas. Close to shops and bookstores. Open 7 days a week and well situated overlooking the Mill Pond the Café Inn is a great place for a rest stop. They offer delicious breakfasts and have daily luncheon specials. They are open late on Thursday, Friday and Saturday and have special Martini nights as well as guest DJ's and Jazz music on occasion. A fun and laid back place with good food. Centrally located Brie & Compagnie are well known for offering a wide selection of international cheeses and specialty goods. 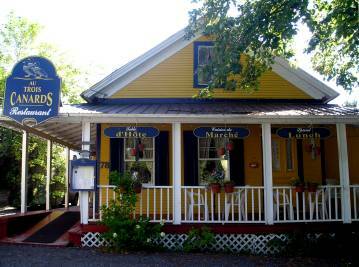 They offer the traditional "petite-déjeuner" as well as a daily lunch special and soup and sandwich platters. They have a full wine and beer service as well as take-out meals all in a unique atmosphere perfectly located on Knowlton Road and Lakeside at the heart of Knowlton. Great place for a BBQ dinner and a beer or just some chips and a cold diet Pepsi. 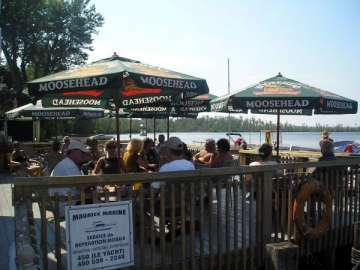 The terrace overlooks the Brome Lake and the fun and friendly ambience are always guaranteed. A variety of sandwiches and daily specials are available for lunch or dinner. Weekend specials. Unusual parties and whacky events can breakout at any time! Enjoy the outdoor deck at the Knowlton Marina. Summer time in Knowlton wouldn't be the same without a cold drink at the Tiki-Bar! More well known for the self-serve gas station and ice-cream bar than a place for food the Depanneur Rouge located across from Oddfellows Hall does offer a variety of daily lunch specials and in the summer has a buffet style salad-bar that is very popular and quite tasty. Their traditional breakfast specials are very popular and it is a busy place in the mornings as people take time to read the paper and have a bacon and eggs special. New restaurant offering "québecois" and Asian cuisine. Everything from spaghetti and club-sandwhiches to Qabuli Palao and Sambusa!. Also pizza and submarine menu. 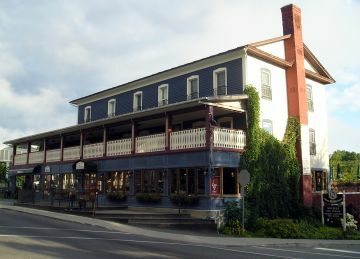 Looking for a restaurant in The Eastern Townships? Use our search tool powered by Google. Au Trois Canards, fine dining in Knowlton. This resto-terrasse in the heart of the village offers a large deck with a great view of the Mill Pond. They serve quality meals as well as homemade deserts and cappuccino and specialty coffee. There is a full evening supper menu with many specialties including, naturally, duck. A wonderful spot on warm evening overlooking the church at the mill pond. Well known as a favorite watering hole the Knowlton Pub offers traditional pub-style food; burgers, fries, pizza as well as daily lunch and dinner specials. The food is inexpensive and is above average quality for a pub meal. The menu is quite large and varied, including a popular Mexican section. and Biftheque steaks, that are outstanding. They have many customers who return again and again to enjoy our food and atmosphere. You have to try their home made Peanut Butter Pie! The large outdoor terrace is popular during the summer for thirsty travelers who need to have a cold pint in the perfect place to watch the downtown action. Video poker terminals are also available. Music, dancing and plenty of drinking available most nights. The reopened Lakeside Restaurant has one of the best terrasse views in all of Knowlton directly beside the dam on the Mill Pond. Fine dining with special creations for distinguished tastes. The terrasse directly overlooking the Cold Brook has got to be the highlight of a visit to Frostys. They offer soups, salads., sandwiches and a variety of appetizers and of course domestic and imported beers. Another popular watering hole they offer music, darts and pool as well making it a perfect place to relax over a few pints with friends. Check out the local colour! Le Relais restaurant is part of the historic Auberge Knowlton and has wide open windows in the front and a cozy terrasse out the back. One of Knowlton's finest places to visit. A popular hotel and restaurant located across from the Pettes Library, this famous landmark has a colorful history dating back over 100 years. Now a world ranked choice among the editors of Fodor's travel guides, the restaurant has an outdoor dining area that is raised above street level to give nice evening views of the village. The large windows in the front of the restaurant overlook the main intersection where antique shoppers and strolling visitors enjoy the fresh air. The food is good with a nice variety and daily specials. New pizza parlor in central Knowlton to cater to your hunger for submarine sandwiches, poutine, pasta, chicken wings, pitas and of course...pizza. There is an outdoor terasse as well for warm days during the summer. The only "fast food" restaurant nestled in the center of town amongst the antique shops Valentine's is the perfect spot to satisfy your cravings for hot-dogs and poutine! Grab a take-out burger special and head to the Mill Pond park for a picnic at one of the tables. Inexpensive fast food, just as greasy as you're used to! Home cooking restaurant with a nice large outdoor terrace for summer time dining. Situated on a fairly busy corner, Victoria and Knowlton Road, the outdoor area can get noisy but the food is decent fare with a varied menu and daily specials for lunch and dinner. Pizza and salads and dinner specials typical of a Greek style family restaurant. Well situated in the center of Knowlton Across from shops and antique stores, Papa Spiros has a terrasse overlooking the main village intersection. Chinese and typical greasy-spoon type food is a very popular amongst the local laborers for the no-nonsense meals and decor reminiscent of many old fashioned Chinese food joints as well as the outdoor smoking terrasse. Also serves breakfast and has daily lunch specials. Delivery service is offered. Easy to spot due the bright orange roof, Chez Guy has been a popular spot with the local workers who need an inexpensive and hearty meal. Traditional family-style dining room with a varied menu of standard Canadian foods. This restaurant was hit by a speeding car and burst into flames and is now closed...arteries across the Eastern Townships heaved sighs of relief!